Stay Tuned for a Special Announcement! Here is a little about Amanda and her store. 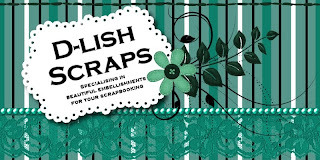 D-lish Scraps is an online store that specialises in unique embellishments for scrapbooking and paper crafts. We have an extensive range of mulberry paper flowers that are both beautiful yet affordable. Our prices are kept low by buying in large unpackaged bulk quantities and packaging here at the store ourselves. We also stock buttons, ribbons, laces, leaves, journaling cards and handmade flowers. Here are D-Lish we pride ourselves on being low cost without compromising on quality. Our shipping rate is a low $3 to anywhere in Australia which is just another way of keeping your costs down. We hope you will take a moment to look around the store … we know you won’t be disappointed!